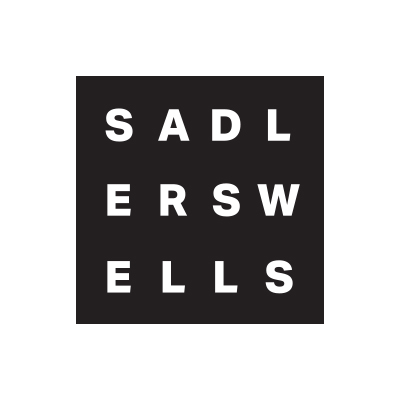 Sadler’s Wells inspired a group of primary school pupils to learn more about theatre technology as part of a scheme introducing children to diverse STEM role models. Designed for Hackney primary schools, iDiscover aims to excite pupils in their studying of the STEM subjects (Science, Technology, Engineering and Maths) by understanding how these are applied in the workplace. As part of the scheme, Thomas Fairchild Community School and Colvestone Primary School visited Sadler’s Wells in May and July for a week-long programme of work-related STEM activities. The workshops demonstrated how technology is used within the creative industries, with participants watching live demonstrations of how technology plays a part in the staging of Sadler’s Wells shows, as well as engaging in some hands-on group activities. At each session, a group of around 30 children aged 8-9 took a backstage tour of the theatre. Sam McLeod, our Head of Lighting and Sound introduced the job of a lighting technician, showing the children how to focus, control and change the colours of the lights on stage. Technician Tom Pritchard also talked the students through the job of a Sound Technician, demonstrating the sound desk and showing the students how to control volume and use the microphones. Finally, Technical Manager for the Peacock Theatre Chris Booth introduced the job of Production Manager, explaining stage terminology, leading them through the process of building and designing a set and illustrating special effects such as smoke and pyrotechnics. 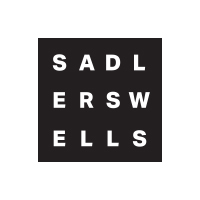 It was fantastic to engage the children with the STEM subjects through practical learning at Sadler’s Wells, and we hope the experience may inspire some of them to pursue technical roles in the arts in the future! 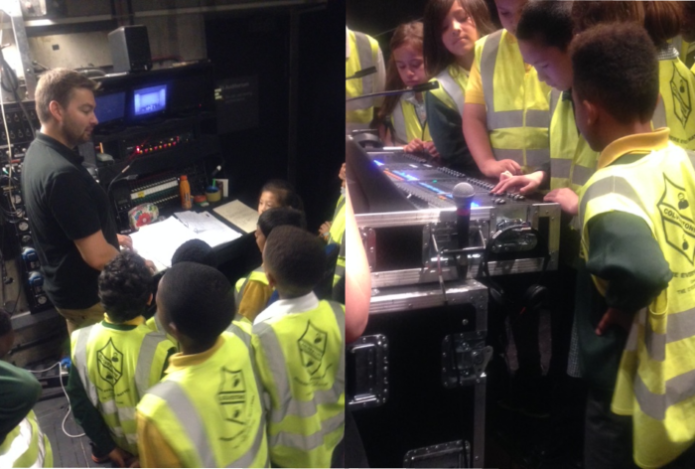 Images: students backstage at Sadler’s Wells theatre taking part in an iDiscover STEM workshop. Budding young rappers and aspiring creatives came together over June half term for Graffical 2017, a two-day workshop led by our Breakin’ Convention team. A group of 13 to 16-year-olds from across London took part in the project, which aimed to engage young people with rap lyricism and spark their creativity through writing and visual art. Mentored by rappers and educators Poetcurious and Kingpin, participants analysed their favourite rap songs, exploring the social and political issues addressed by the lyrics, as well as the personal meaning the words had to them. Alongside this, they worked on writing their own lyrics with the purpose of inspiring their families and communities. The group also collaborated on a mural, which is on display at Corker Walk behind the Andover Estate in Islington, north London. 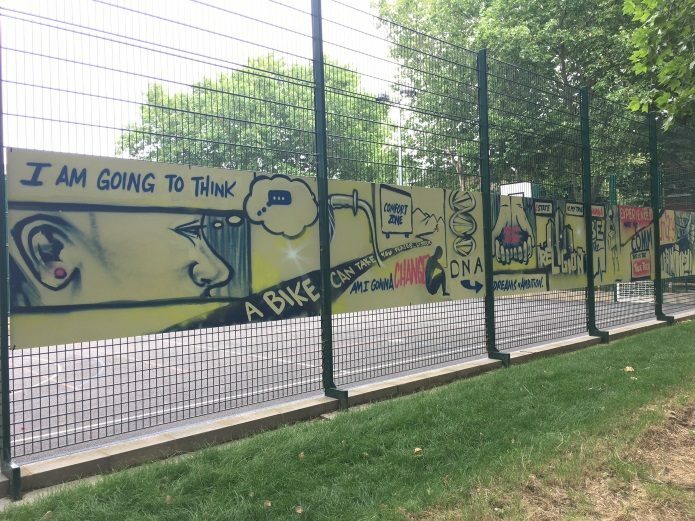 Overseen by graffiti artist Mr Dane, the teens brought their words to life by incorporating themes from their lyrics into the sprayed work. Graffical 2017 was a huge success and the mural is a truly vibrant addition to its surroundings. Thanks to Islington Word Festival for helping to fund the project and Lyrix Organix for collaborating with Breakin’ Convention to deliver it. We are also grateful to Samir from Emirates Stadium and Jacqueline Robinson from Islington Council who supported the project. Image: the mural realised as part of Graffical 2017 at Corker Walk off the Seven Sisters Rd in Islington.